An economic downturn is imminent, according to three major banks in the know. Investors should be especially fearful that a market crash could present itself sooner rather than later. After all, the major banks don’t issue such warnings lightly. They have securities to sell you. The fresh warnings come from a trifecta of major global banks. HSBC Holdings plc (ADR) (NYSE:HSBC), Citigroup Inc (NYSE:C), and Morgan Stanley (NYSE:MS) all see mounting evidence that global markets are in the last stages of rally mode during this business cycle. Once the cycle goes negative (aka recession), markets can only go down. Why? Because corporate earnings typically crash 50% or more during garden-variety recessions, even more during hard recessions like the one following the U.S. Housing Bubble. Peak-to-trough earnings fell over 90% during that one. According to the analysts, investors are pricing risk based on individual assets instead of the broader drivers. It doesn’t seem to matter how tepid the economic data is. Investors are looking for reasons to stay bullish, instead of listening to what the market data is saying. “[The data] confirm the idea that we’re in a late-cycle environment, and it’s no accident that the last time we saw readings this low was 2005-07,” wrote Sheets. In other words, normalcy bias is causing smart people to think irrationally. What is normalcy bias? It’s a mental state that people enter when facing a disaster. It causes people to underestimate both the possibility of a disaster and its effects, on the basis that things will always function the way things normally function. As the market moves up in a straight line for years, it causes people to believe this is activity is “normal.” Investors also become addicted to their bulging portfolio gains, and “wish” or “hope” that the gains can continue. The problem is, it cannot continue. A broad economic slowdown, combined with the Fed’s stated goal of paring its balance sheet, could decimate the market. The normalcy bias that people become accustomed to could shatter like glass on concrete. Unless they’re prepared for it, investors can easily become trapped. Are Corporate Earnings Being Disregarded? As all investors know, stocks are valued on future discounted cash flow. In a nutshell, it means the higher the stock’s future revenue streams (dividends, earnings, or cash flows), the higher the stock should trade on a net present value basis. Corporate earnings are the biggest driver in this equation. But presently, corporate earnings don’t seem to matter to investors. This is signalling that something is amiss in the markets. 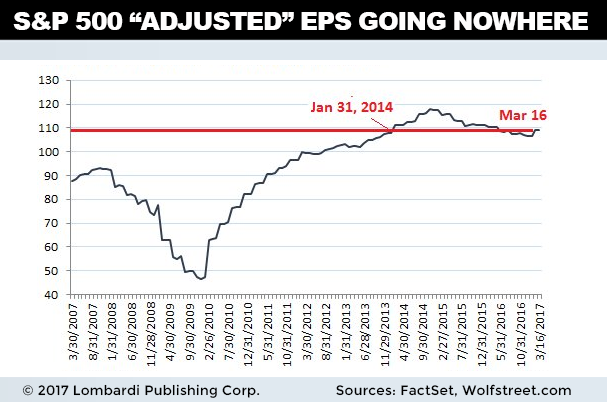 Although corporate earnings have been essentially stagnant since 2012, stock markets keep driving upward. Valuations are being expanded without sound reasoning. This has experts concerned. Moving to the credit markets, the situation isn’t much rosier. HSBC published seven leading or coincident indicators that exemplify how “mature” this business cycle really is. Everything from “yield curve flattening” to “stock market cap to GDP” was measured. The results: four of the seven indicators showed the business cycle in the late stage, while three of the seven indicate mid-stage. There’s little doubt that the sunset on the third-longest business cycle in history is grinding to a close. In the end, the big banks are worried about equity valuations at this late business expansion stage. We’ve said it numerous times on Lombardi Letter before: high valuations and recession make terrible bedfellows. They cannot, and will not, co-exist when corporate earnings start crumbling. When the market conclusively realizes that a recession is drawing close, the volatility and unwinding will happen. According to the banks, a market crash is just a matter of when.